By default, Kiosk Pro's settings menu is shown when the app is launched. When you are ready to see how changes you've made to the app's settings affect your presentation, you can tap 'Run Kiosk Presentation' in the top left corner of the settings menu. You can access the in-app settings by placing four fingers on the screen (two on each side) and holding your fingers there until a passcode prompt appears (about one second). This prompt will automatically disappear after a short period in case it has been accidentally triggered by a visitor and left open. 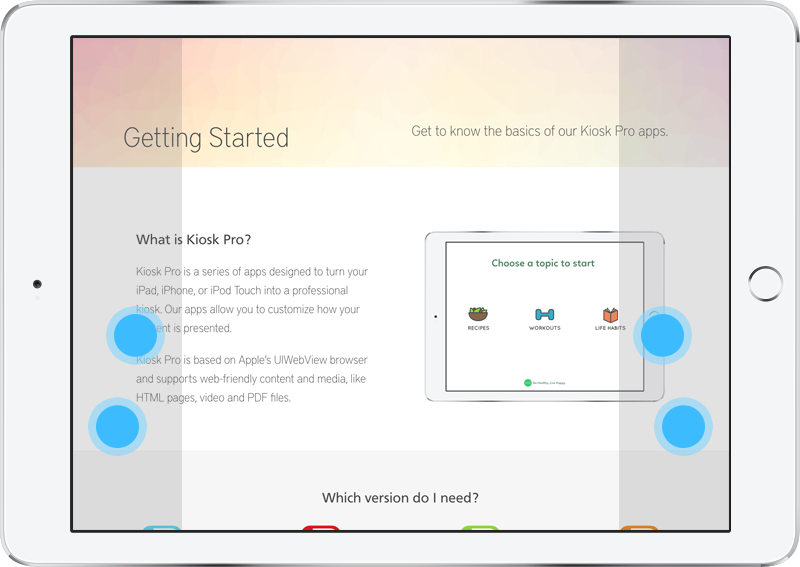 You can set in-app settings to never show, but if you do not have Remote Settings Control enabled and correctly configured, you will not be able to change Kiosk Pro's settings without deleting the app and re-installing. This passcode protects the Kiosk Pro settings when using Show Settings > On Touch Gesture and Passcode and generally consists of a four digit string. While we suggest a 4 digit code for simplicity, the passcode field can validate a much longer string (up to 30 characters) and accepts both numbers and letter (which are case-sensitive), allowing you to create a more secure passcode if needed. This passcode is not recoverable for security reasons. If you lose or forget the passcode, you will need to either reset it using Remote Settings Control if configured or delete and reinstall the app to regain access to the settings menu. If you accidentally set Show Settings to On Touch Gesture and Passcode, the passcode is empty by default, so you should be able to just touch 'OK' when the passcode prompt appears. Autonomous Single App Mode is a feature of iOS that allows an app to enable and disable a Single App Mode session from within the app itself. Single App Mode is similar to Guided Access, but, unlike Guided Access, retains control of the device even if the battery dies. A Single App Mode session can be started through Apple’s free Configurator software for Mac or through an MDM (mobile device management) like JAMF Pro or SimpleMDM. currently be supervised either using Configurator or through the Device Enrollment Program. currently be enrolled in MDM (mobile device management). 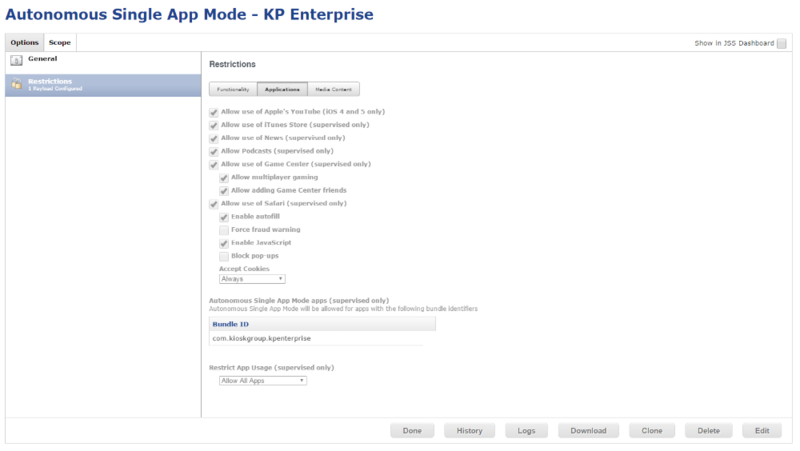 have a configuration profile set up and installed through the MDM that sets the restrictions key ‘autonomousSingleAppModePermittedAppIDs’ and includes the app’s bundle identifier (‘com.kioskgroup.kioskproplus’ or ‘com.kioskgroup.kpenterprise’). It is not possible to install a configuration profile with this key through Configurator at this time. The process of setting up a configuration profile differs from one MDM provider to another so you may need to consult with your MDM provider’s support team to determine if they currently support profiles that include this key and how to configure that profile. In AirWatch, you'd create a new Single App Mode profile and using the filter type option at the top of the panel, select the option to list apps that are eligible to enter Autonomous Single App Mode. This setting lets you choose when to lock the app to Autonomous Single App Mode. Lock Manually allows you to lock/unlock the app from within the app settings (button in top right corner, see below) and will show a native alert for several seconds confirming the start and end of any session. This secondary passcode allows for an Autonomous Single App Mode session to be ended without allowing access to the app's settings menu. After performing the 4-finger touch gesture used to access settings, you can enter this passcode instead to immediately unlock Autonomous Single App Mode. This can be useful for devices in the field that may lose internet connection and require that an employee be able to exit the app to get to iOS Settings > Wifi without being able to reconfigure the app itself in any way.